I've been lent a Canon HV20 to use for webcasting talks. I plan to mix the live vision with slides and a few effects and so on in a dedicated QC based application. I'm trying to view video form the device in the QC Editor and I can seem to get anything. It is appearing as a device ("HV20") in the settings inspector for the stock Video patch (connected via a miniFW->FW800 cable). Using Kineme's Video Device Info patch I can't seem to get a read on it. It is show in iMovie with a LIVE video signal. What things might I try to get a video signal into QC? For example tips for QC Editor or some other app I can syphon from into QC. Really hoping I can get a signal from this camera since it has zoom and a mic input and also I can record to tape for recuts after the events. Has anyone used any of the Blackmagic Intensity devices to get Live video into QC Editor successfully? That's another option as is getting a Canon 7D and trying out the open source Syphon/Canon API based app mentioned in the Syphon forums. Kineme VideoTools supports IIDC/DCAM-compliant FireWire cameras. Consumer camcorders such as the Canon HV20 use the AV/C FireWire protocol, which is incompatible. I've had some success reading the signal from my Canon HV30 into QC using the built-in Video Input patch, but only when the HV30 is set to SD mode (when in HD mode, it doesn't show up as an option in the Video Input patch). Thanks @smokris. Success. Camera was set to the only mode that isn't compatible with QC Video patch "HDV (PF 25)" which I think is a progressive setting — perhaps suited to the Australian PAL video standard b/c the guy who lent me camera said 'trust me you want it set to this because… [something I don't recall]'. So I can actually get a picture in HDV mode which is exciting! I seem to recall installing the ProRes codec pack from Apple (using Pacifist, it does a software check), and was able to get HD video from our Canon HDV XHA1. So my next problem is that I want to make an App with QB that does all my Video / Stills mixing but the camera choice in the stock patch is on that darned Settings Inspector panel not an input port. Fortunately seems I can hard wire the HV20 selection if I have the camera connected when I build the QB App and when I launch said application (kinda boring) but I can't build for a camera someone else might want to use. Any work arounds for user input of camera? Providing a Syphon option with Structure index exposed to user is only thing I can think of and other users will have to build there own Camera–>Syphon solution in QC or QB or elsewhere. Anything smarter? What if I was to learn how to build my own Cocoa App (think .qtz file + NIB and not much else) in Xcode, would it be possible without importing a Video Library or something extra complex? The codec you need to ingest HDV, is "AppleHDVCodec.component", which shipped with FCP 6 and 7. It allows 32 bit Quicktime compatible applications using QT Capture API's to find connected HDV cameras and input video from them. This works with Quartz Composer in 32 bit mode with Apples built in Video Input patch. 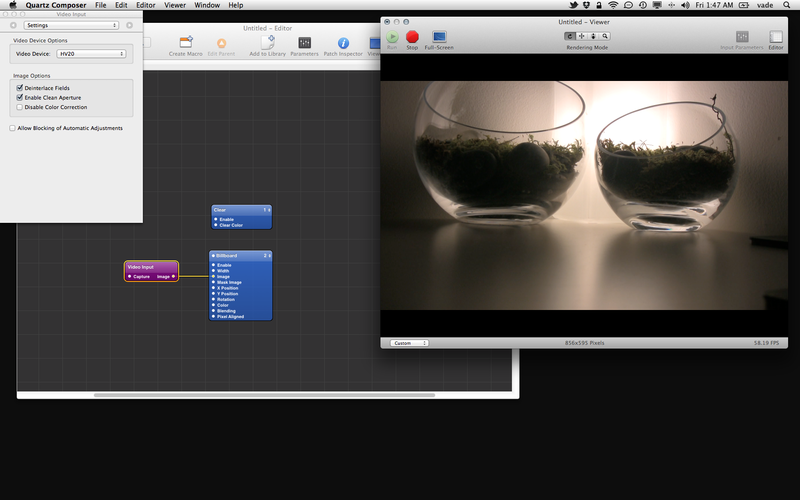 As for the Intensity, this will also work in 32 bit mode (in QC, via Video Input), using Quicktime Capture APIs. I've used it many times, as well as capture devices from AJA and Matrox. I Use a black-magic intensity pro PCI card which works well, only in 32 bit mode. I tried it successfully with several HDMi cams, including Canon EOS 5D (which gives a great picture but is strongly limited by its very annoying 30 minutes max time of continuous use). Worked well with other consumer camcorders. Did work for me under 10.6.8, 10.6.4 Hackintosh, and 10.7.4. FYI : it is perhaps out of topic but I found a special HDMI cable of 15meter (video equipment rent shop) which exceeds the 10-meter HDMI max length. This avoid me the expensive use of other SDI>HDMI and HDMI>SDI converters and I didn't notice any obvious problem of quality. I actually was able to see the HV20 video with the standard patch (I'd been trying the Kineme patch thinking it naturally superior to stock patch but it seems to be compatible with a subset of FW camera's see @smokris comment) so I must have that codec already installed… I migrated stuff from my Leopard Mac (regrettably for many reasons) which had FCP7 installed. Also I'm using QC in 64-bit mode and it's still seeing the live video from HV20! I'll grab it for when I do a clean install of my MBP to lose all the Leopard migration crude which has already forced me into a new OS X user account for all the hangs and crashes. Main problem now is that I can't expose camera selection as a published-to-root user selection without having all the camera's connected via there own Video input patch going into multiplexer when I save the .qtz file and QB app made from it. I would have preferred something more open-ended but that's an inherent problem limiting inputs to the settings inspector in QC. Old argument but not stale yet! What is the performance cost of running QC in 32-bit. I realise that question is too open-ended in that applications will vary in there memory requirements etc. Is 64-bit more stable? Isn't Quicktime-X 64-bit? At what point could Intensity stream be used in 64-bit applications? Just wondering out allowed — I'll make do with what works for now. Thanks for the info, zanroversi. That's strange about the Canon 5D. What happens after 30mins? How long before you can start using it again? It's not a battery thing is it? Here is a application that can grab the feed from many of the Canon Digital cameras and feed it to Syphon. Not sure if its already been posted but might be helpful to a few people. I emailed alastair an alpha-grade plugin that I'm thinking should solve the problem for him(?). Kinda curious to hear the report back. After 30 minutes of use in live-view, the EOS 5D (mark II) closes the shutter and exits live-view mode. Battery is ok (notice that consumption increases dramatically during liver-view). As far as I know, it's not well documented by Canon but it's a known issue on specific forums. This could be a safety behavior, preventing CMOS for being damaged or a question of CMOS over-heating. (also : when the shutter is kept opened, its electro-magnet is powered and get warmer). I'm not sure of that. When it happens, you must restart the live-view mode manually... (and re-launch QC viewer in my case). You can do this just after it happened. There is a Canon SDK for cocoa, delivered by Canon in USA only. They did allow me to download it, I filled a form for that, explaining my project in detail... I ran the test app and it appears you can start/stop live-view with it. There is also a way to get live-view image via USB but with a very-low frame rate (a few frame per second). I tried it successfully. Hey George. I never got it, well I never saw it! I've switched OS X users twice recently and maybe it got lost in the turmoil… I'm interested in your plugin. Have you seen this thread on Syphon that links to a Syphon and Canon SDK based app by Blair Neal for use with Canon cameras? Maybe it's you?! EDIT: Just noticed @destroythings has already posted about the Canon-Syphon project. @usefuldesign : Sorry for this late answer. I'm very excited by this info, thank you, I will try this as soon as possible ! Thanks for bumping the thread, zanroversi. I actually need to sort out sound now so time for another post. The stock Firewire Video patch in Quartz Composer doesn't seem to bring the audio tracks in. What are my options for bring in the sound from the camera/camera jack. I was hoping to use the camera jack with a mic because there is a lag of 0.5-1sec on the video image so if I just rout a mic into my MBP line-in and use soundflower to patch it through to Flash Live Media Encoder it will be out of sync with HV20 images, which will be my main camera, a Logitech 920 will be providing reverse shots of audience so syncing less of an issue for that camera (at this stage). Is there anything in the Kineme Audio Tool kit bag that can help with this? I believe Magic Lantern (www.magiclantern.fm) can bypass that autoshut off function on LiveView, I haven't looked at it in awhile though. Is there a specific reason for you not to use an input video card with audio capabilities ? Cost, compliancy with a macbook pro ? FYI : According to a black magic design technician, with a mac-mini, it should be possible to use thunderbolt for video input and mac-mini-HDMI for output (input with an intensity extreme thunderbolt card). @mattgolsen : thank you this will be quite useful ! http://wiki.magiclantern.fm/userguide#powersave_in_liveview Sticky HalfShutter This will make the half-shutter press sticky (so you no longer have to hold it pressed). Tip: use this to prevent the camera from turning off LiveView after 30 minutes. Moreover, there is a lot of useful additional settings like LV image controls for use in darkness, etc.